Write Sketch & is a high quality stationery brand, founded in Milan in 2014. All its products are 100% Made in Italy and are a combination of an avant-garde aesthetic language with a deeply international vision. Write Sketch & (WS&) is a brand founded in Milan in 2014. Its products are characterized by an avant-garde aesthetic language combined with a deeply international vision. The project’s creators are Matteo Carrubba and Angela Tomasoni, who, for more than ten years have shared their commitment between the management of Officemilano, a specialized Milanese agency in art direction and branding, and teaching at the Istituto Marangoni. Their common passion for graphics and sensitivity for fashion have profoundly influenced the project of WS&, a mix of Italian design tradition and experimentation with the fashion world. Super! Collection is the first line of reversible A5 notebooks, fun and colorful, full of patterns and frenetic geometries. Each face of the covers represents a graphic in itself, which is completed with its opposite face. Afterwards, new collections were introduced, such as the pocket sets of A6 notebooks and metallic notebooks, colored decorative papers, weekly planners and pleated tote bags. The latest novelties of the brand concern desk accessories. The transparent resin rulers characterized by an amusing game of patterns and transparencies, and the golden brass bookmarks, elegant and sparkling, in three models: Waves, Stripes and Grid. the most prestigious museums, such as the MoMA in New York, the Guggenheim Museum or the Biennale di Venezia. Metal Notebooks are our top quality products in the notebooks field. 128 pages of beautiful milky italian paper. 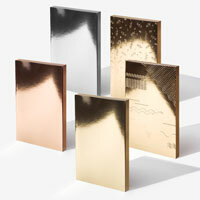 Cover can be in 4 different metallic finishes: gold, silver or copper. The side of the notebooks are gilted or silvered of copper, giving the feeling of a real metal ingot.